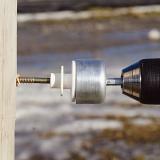 Allows use of a power drill to rapidly screw Wood Line Post insulators in and out of a wood posts. Pays for itself if you install or remove many insulators. Use with Wood Line Post insulators. Depth of cup is 1"
Put bit end of power driver into chuck of drill and tighten. Insert the Wood Line Post insulators into cup of driver, lining up slot in jaws of insulator with pin inside cup. 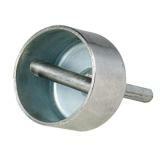 Give a half-turn to lock the insulator into driver. Screw insulator completely into post. Give a half-turn in the opposite direction to release insulator from driver. 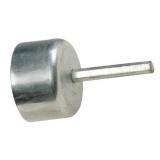 This is a very convenient product- I can't imagine trying to put in any number of insulators without it! However, I would recommend that two little notches or indentations be put on the barrel of the driver to mark when the insulator is upright. That would save time- I marked mine with a permanent marker which worked great except that it rubbed off a few times.